Here in New England, we are a hearty population used to a variety of weather extremes. A good snowstorm is not unusual in January or February. But this year has brought us more significant snow amounts and record cold weather than we are typically accustomed to. And it’s not over yet! Some of us can remember The Blizzard of ’78 which was an epic blizzard sometimes referred to as a 100 year storm. My family lived in a raised ranch just north of Boston. The storm started on a Monday and lasted for what seemed like a week but was actually about 2 days. I was in high school at the time and we woke to a snow drift against the dining room slider that completely blocked the door. The front door was blocked and we could not see my parents 1971 Plymouth Satellite Station Wagon in the driveway. The only way to let my mother’s miniature French Poodle out was to open the garage door under the house and dig a spot for him. We were out of school for 2 weeks (fortunately, the second week was February vacation). This winter (2015), we have received nearly 7 feet of snow here in southern New Hampshire. Parts of Massachusetts received more. And I am sure there is more coming! These storms are no comparison to the Blizzard of ’78 but cumulatively – we have lot of snow in a fairly short amount of time. So where am I going with this? 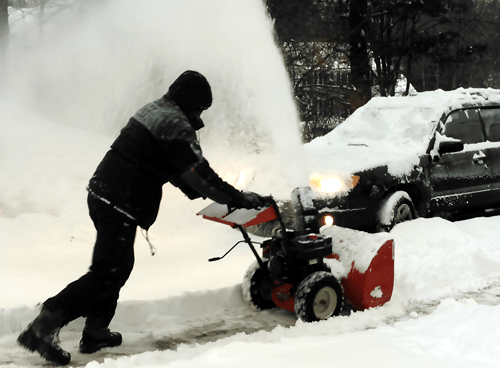 Removing snow manually or with a snow blower IS a workout – potentially an intense workout. At least that is what I keep telling myself as I shovel, clear the cars, blow snow, dig out the stairs, and shovel off the roof. You are working all planes of movement and it requires strength in pushing, pulling, squatting, carrying a load, and hinging at the hips. Some studies indicate that the energy expenditure between shoveling manually and using a snow blower are similar. Others say that using a snowblower is easier. I feel a good workout either way! Snow removal requires very intense effort and you must be in reasonable shape with no medical conditions or cardiac risk factors. Make sure your physician has cleared you to remove snow especially if you have any health issues! As I put myself through this torturous workout, I thought, how can I make this fun? It’s not. But I think about my exercise form and turn it into a workout. Outdoor activity in Winter – get outside! We need more outdoor air and activity! High intensity exercise – yep. Unless you hate cold weather, I cannot think of any! Listen to your body – injuries occur when we are fatigued. Rest appropriately! Early morning shoveling is particularly strenuous on your body so use extra care and attention to your body’s response. 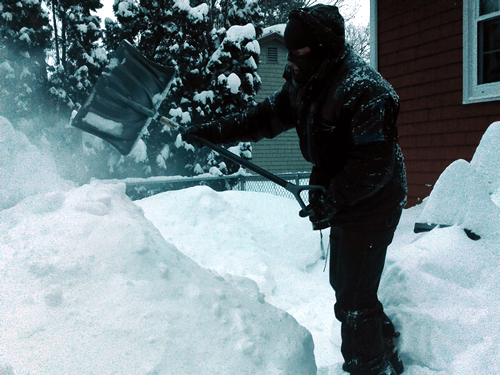 Well to start, shoveling is a total body exercise requiring good form and a strong core. If you are generally healthy and fit you can get a good workout as long as you use good movement form. Most folks use their low backs and arms primarily which is bad movement. When shoveling snow, think about keeping the glute muscles tight, abdominal muscles strong, shoulders back, and use thoracic rotation when throwing the snow. We do medicine ball exercises that work multiple planes of movement helping us build strong trunk movements applicable to shoveling snow without hurting ourselves. 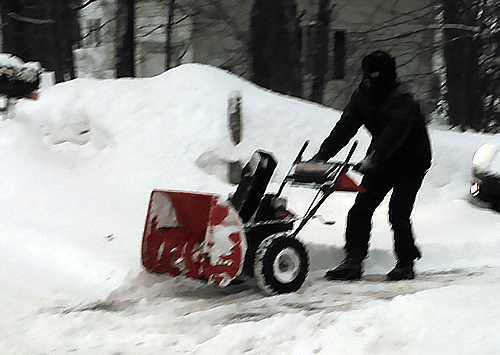 Using a snow blower may seem easy but it requires nearly as much energy expenditure as shoveling. Using my MTD 5 HP snowblower purchased in 1995 at Montgomery-Ward (no this is not a product review! ), I am performing sled pushes. Keeping the gear set on a medium speed helps not only clear the deeper snow but requires more effort to push. This is a strength move and can require power as you push into those piles of snow! Sled pulls are great for developing posterior strength. Why use the reverse transmission when I can pull it! CAUTION! The ground is slippery which causes you to potentially use poor form while trying to maintain your footing. My position below places a little more stress on the low back than I prefer. If you wear Creepers or Yaktrax you will have better traction allowing for better form. This is a somewhat “tongue in cheek” workout. We are all a little “snow drunk” this Winter and as long as you are healthy, you can make the best out of your snow removal effort! Enjoy the outdoors and be careful out there! Only a few more weeks to Spring!